Vijayawada: A heavy quantity of tonsured hair donated by devotees was stolen from the famous Mallikarjuna Swamy temple at Srisailam in Kurnool district of Andhra Pradesh, police said on Friday. Thieves broke open the window rods late last night and gained entry into the ‘kalyana katta’ where pilgrims are called to fulfil the promise of tonsure. They then broke open one ‘hundi’ (donation box) and emptied it of the hair. They tried the same with the second hundi but gave up halfway through, according to police. 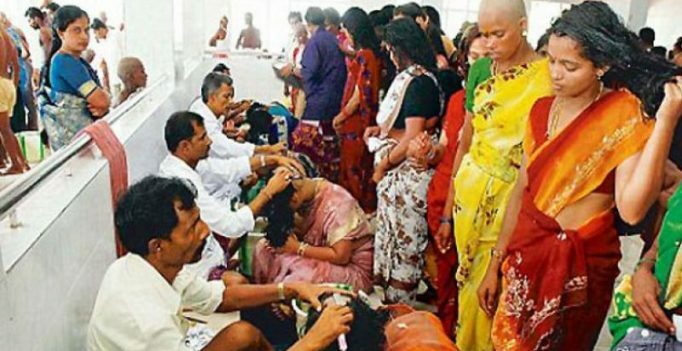 Devotees tonsure their heads and offer hair to the Lord as a custom in fulfilment of their wishes. The temple authorities conduct an annual auction and award a contract to the highest bidder. The contractor concerned collects the hair and stores it in hundis before moving it out in bulk for sale. The hair fetches a handsome price in the national and international markets. After the burglary, the hair contractor, hailing from Tamil Nadu, visited Srisailam this evening and formally lodged a complaint with the police, said Deputy Superintendent of Police Supraja. The value of the stolen hair was being estimated, she said. The police were scanning the CCTV footage from the temple for possible clues on the theft and the burglars.